From Peter Salerno’s Kitchen: Sicilian Ricotta Cake Recipe – Design Your Lifestyle. Need the perfect dessert recipe to compliment the perfect cup of coffee from your TopBrewer coffee brewing system? Why not try out a classic Sicilian dessert recipe, tested and approved by Peter Salerno? Ricotta cake (also known as Cassata) is a staple dessert from the classic Sicilian cookbook, with the perfect blend of sweet and savory, rich and creamy, light and airy. As usual, our friends at Saveur have created our favorite recipe for Sicilian ricotta cake, rimmed with pistacho marzipan and created with a touch of Grand Marnier. From your first bite of this ricotta cake, you will experience the rich creaminess of ricotta, the zest of orange, the lightness of confectioner’s sugar, and the nutty balance of pistachio marzipan. Try it for yourself – we’re sure it’ll become a household dessert favorite! 1. Heat oven to 350°. Grease and flour a 9″ cake pan; set aside. Combine ⅔ cup sugar, zest, and eggs in a large bowl and beat on high speed of a mixer until pale and light, about 5 minutes. Add flour and fold to combine. Pour into cake pan and smooth top. Bake until a toothpick inserted in center of cake comes out clean, about 30 minutes. Transfer pan to a wire rack, let cake cool completely, and remove cake from pan. Using a serrated knife, cut cake crosswise into ½″-thick strips; set aside. 2. Line bottom and sides of a 12″ metal pie plate with plastic wrap; set aside. Process pistachios in a food processor until finely chopped. Add 1 cup confectioners’ sugar and process until finely ground. With processor running, slowly add enough egg white to form a smooth dough. Transfer dough to a work surface dusted with confectioners’ sugar and knead until smooth. Using a rolling pin, roll marzipan until ¼″ thick. Cut into 2″-wide strips and line side of pie plate with strips, flattening where they overlap to form one continuous ring; set aside. 3. Heat ¼ cup sugar and ¼ cup water in a saucepan over medium-high heat. Cook until sugar dissolves, then stir in Grand Marnier; set aside. In a large bowl, whisk together remaining sugar, ricotta, vanilla, and cinnamon until smooth, 2–3 minutes; set aside. 4. To assemble, line bottom of prepared pie plate with cake strips, cutting to fit, and then sprinkle with 5 tbsp. Grand Marnier syrup; place ricotta mixture on top of cake and spread evenly to fill pie plate, smoothing top. Cover top of ricotta mixture with remaining cake slices, cutting to fit evenly, and drizzle with remaining syrup; trim excess pistachio marzipan and then wrap pie plate in plastic wrap and refrigerate until chilled, 2 hours. Meanwhile, combine remaining confectioners’ sugar and lemon juice in a medium bowl to make a thick glaze. Invert pie plate onto a serving dish and peel off plastic wrap. Pour glaze over cake to cover evenly. 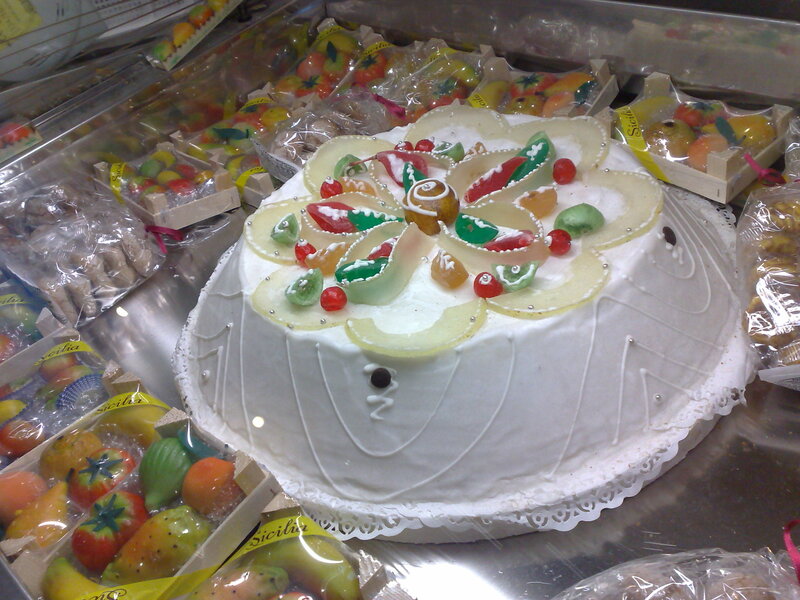 Decorate with candied fruits. Refrigerate cake until set, 2 hours or overnight.